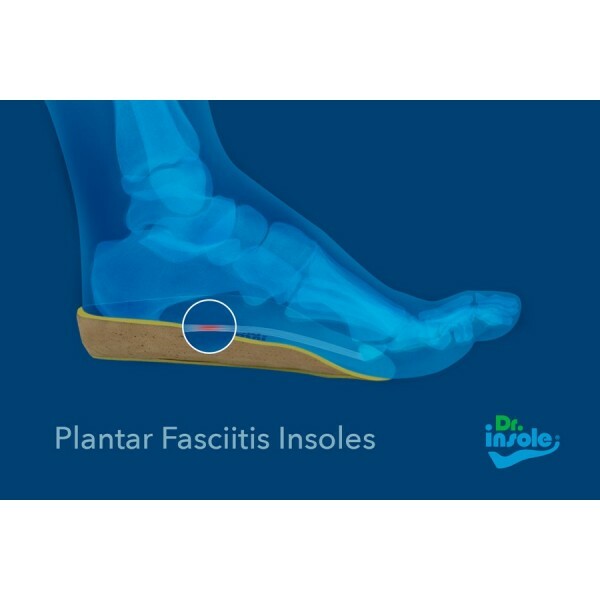 Dr Insole’s orthotics for plantar fasciitis (jogger’s heel) help to heal the damaged connective tissue under the sole of the foot. Our insoles eliminate the stress and the pressure on plantar fascia, thus reducing heel pain and significantly accelerating the recovery of the tissue. Our insoles provide firm support for foot arches and comfortably cushion and protect your heels. Individually prepared to suit your needs, they correct gait abnormalities and restore natural foot position, giving you pain-free, healthy feet. Plantar fasciitis, also called jogger’s heel, is the most common reason behind heel pain. It is estimated that about 10% of people will suffer from plantar fasciitis at some time in their lives. It results from damage and thickening of the band of connective tissue, called plantar fascia, that runs under the sole of your foot and joins your heel bone with your toes. This flexible band of tissue gives support to your foot arch and absorbs shock when you walk or run. If plantar fascia suffers damage, small tears may develop in its structure, which can lead to thickening and inflammation of the tissue. It may be caused by recent injury, but may also develop gradually, as a result of many minor injuries to plantar fascia. Sharp heel pain, affecting only one heel, and being the strongest after longer period of rest, is typical for plantar fasciitis. Symptoms are often the most severe when taking first steps of the day and after longer periods of sitting. Walking usually helps to ease the pain. Swelling, numbness, tingling and radiating pain can sometimes occur as well. In some cases, plantar fasciitis causes pain in the front and the centre of your foot. If certain type of exercise triggers heel pain or makes it worse, it is best to avoid it. If possible, try to rest your heels as often as you can and avoid standing, walking and running for longer periods. Putting ice on the affected areas and using over-the-counter painkillers are often effective solutions in treating heel pain. Stretching your toes, your calves and your plantar fascia muscles regularly can ease the heel pain. Heel pads and heel cushions can help your feet absorb shock better when you walk or run. 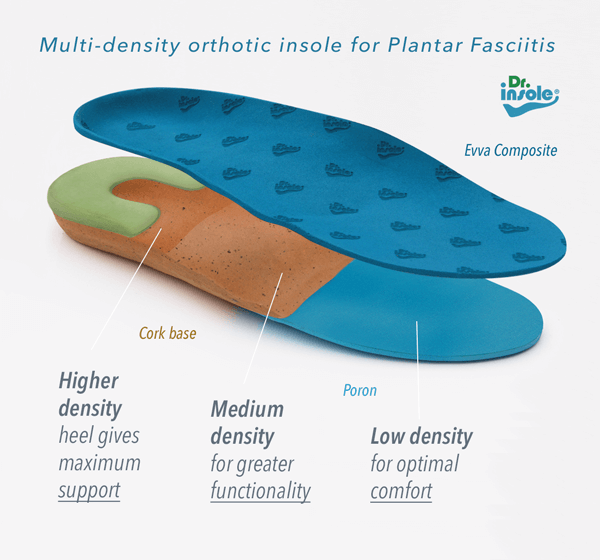 Supportive custom-made insoles effectively reduce the tension on plantar fasciia in multiple ways: they correct biomechanical problems, such as overpronation, they help with alignment and weight distribution, and give support and cushioning not only to your heels, but to the whole surface of your soles. How can Dr Insole’s help? Dr Insole’s custom-made orthotics are very effective in reducing the pain caused by plantar fasciitis and curing the condition itself. It is important, however, that they are tailored to your feet. Because no two feet are the same, it is crucial to recognise the areas that need additional support or protection and then your orthotics can be prepared to correct any specific dysfunctions of your feet. Before we start preparing your insoles, our orthotic specialist will carefully examine your feet, your gait, and they will prepare a cast of your feet that will be used later as a model for your insoles. If we discover during the examination that you have high foot arches or flat feet with overpronation, we will mould your insoles to fix biomechanical problems, which will relieve your heel pain and help cure plantar fasciitis. Our orthotic insoles for plantar fasciitis are designed to target heel pain and its source. 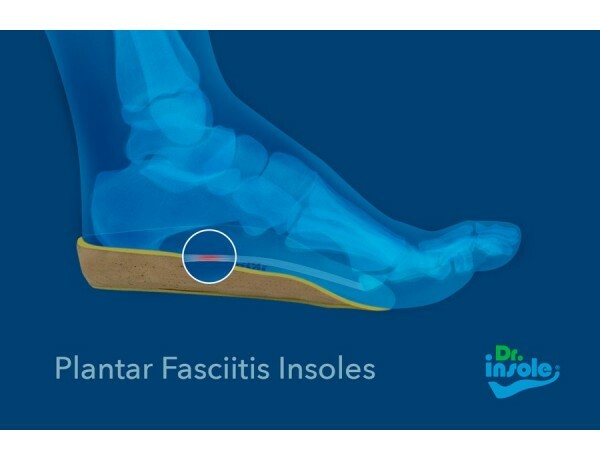 Dr Insole’s orthotics reduce the strain and take away the pressure from plantar fascia, eliminating heel pain and allowing the tissue to heal more quickly.